Tucked in the leafy suburb of Marsfield in the City of Ryde, a stone's throw away from Macquarie University and a minute's walk from Waterloo Park, is an authentic Italian restaurant which boasts the best Mediterranean menu in this part of the city. The staff are all nice and they are all of Italian heritage. There's a lot of them for a very small place such as the Mediterranean Marsfield so you won't have difficulty getting someone to attend to your table. The restaurant is hidden near the community centre, and with a big shopping mall a couple of blocks away, you wouldn't suspect that in this quiet residential district, there is a place where pizza and pasta makes a great impression of home cooking. Chicken Mushroom at the Mediterranean Marsfield. The sauce was lovely, the chicken was tender, and the veggies were crunchy. 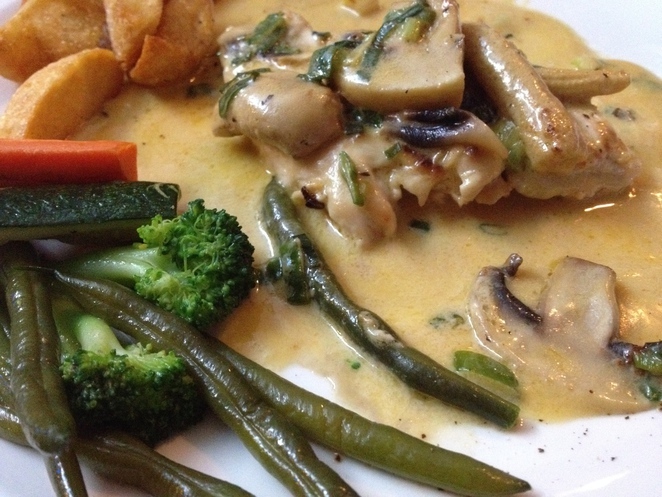 I had Chicken Mushroom, pan-fried chicken breast with mushrooms and baby corn in a creamy sauce, with veggies on the side. The sauce was lovely, not bland and not salty, but just right. The chicken was tender and had flavour, which was surprising for chicken breast. The veggies were obviously cooked but unexpectedly crunchy to my delight. 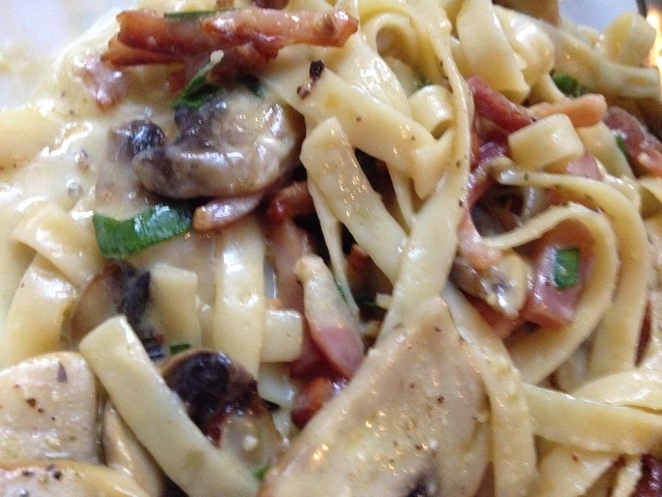 Fettuccini Boscaiola, pasta with bacon, mushrooms, and cream. I also had to taste their pasta and I ordered Fettuccini Boscaiola, a traditional Italian dish that is packed full of flavour with crispy bacon, mushrooms, and chives tossed in a creamy sauce. It was absolutely delicious, an ultimate comfort food that nourishes body and soul. Ham and Pineapple Pizza - straightforward, unpretentious home-cooked pizza. The Ham and Pineapple Pizza was a showcase of the best of home cooking, it was a straightforward, unpretentious pizza full of flavour. The kids loved it. It is always good to dine out every now and then, but instead of going to the mall, find the local restaurants and support local business. You not only support the local business (which is a very important character of Australian society), you also get to eat food not commercially prepared and served with the warmth of home.